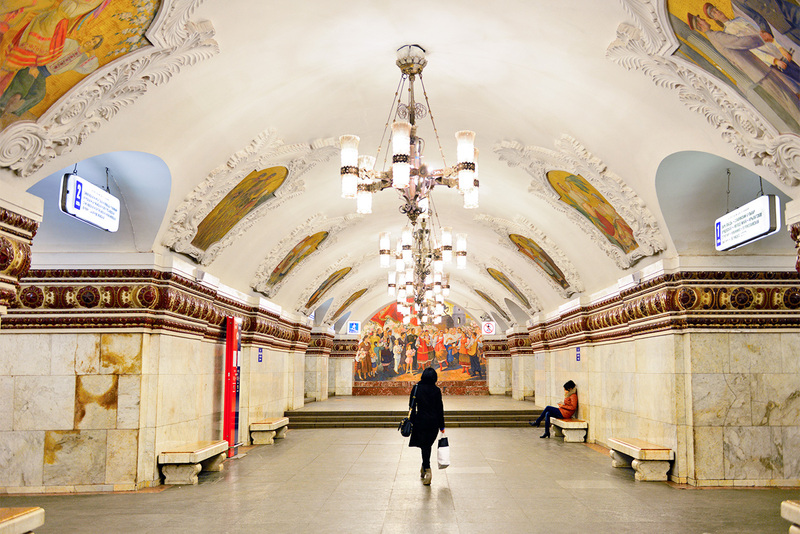 These five remarkable stations of Moscow’s Metro are a free history lesson about Russia. This central station on the Blue Line leads to one of the most recognizable sites in Moscow: Arbatskaya Square and, subsequently, to Arbat St. and New Arbat Avenue. It was designed by Soviet architect Mikhail Polyakov, who among other projects dreamt up the building which currently hosts the Hilton Moscow Leningradskaya Hotel. Arbatskaya has the second longest platform on the Russian capital’s underground, behind Vorobyevy Gory Metro. The station’s floor is made of multicolored granite slabs that form a distinctive carpet pattern while its pillars are decorated with white ceramic bouquets. The station’s chandeliers are made of gilded bronze. A city legend has it that since Arbatskaya station is located next to the General Staff building, it was designed to be used as an emergency bunker for its employees. This marvelous station leads to the heart of Moscow: Red Square, the Kremlin, GUM, and Nikolskaya St. and is connected to Teatral’naya station. Arguably, Ploschad Revolutsii is the most grandiose station of the lavish Moscow Metro: It has 76 bronze statues depicting Soviet people: Soldiers, revolutionaries, peasants, sailors, workers, engineers, students, and many others. Due to limited space in the alcoves where the statues reside, many of the figures are either sitting down, kneeling, or crouched - which was not viewed favorably by the public who thought the body positions symbolised social repression. Nevertheless, Stalin liked the statues, which passersby rub for good luck. Look out for the dog’s polished nose! Kiyevskaya station opens onto the Evropeyskiy shopping mall and Kiyevskaya railway terminal from where trains to Kiev and other Ukrainian cities depart. The station’s decorations are dedicated to Soviet Ukraine and the Pereyaslav Council of 1654, that secured the military protection of the Cossack Hetmanate by Tsarist Russia in exchange for the Cossacks’ allegiance. The walls are adorned with 24 ornate frescoes showing scenes of the daily life of the Ukrainian people - there are also crazy floor patterns. This understated but elegant station is where you get off to roam around Park Pobedy - as you might have imagined. The interior is an ode to the great victories of the Russian people including the Patriotic War of 1812 (Napoleon’s invasion of the Russian Empire) and WWII (Hitler’s failed invasion of the Soviet Union). Designed by the famous Soviet artist Zurab Tsereteli — the author of the "Good Defeats Evil" statue in New York — the southern and northern halls of the station differ in decor, marking the two distinct victories. This modern station only opened in 2008. Nevertheless, it certainly matches the aesthetic standards set by older, more famous stations. Inspired by the works of famous French architect Hector Guimard, Slavyansky Bulvar Metro - peculiarly decorated with metal trees, branches, and leaves - is reminiscent of the classy Parisian Metro.